This drawing is available as a limited edition print. Prints are limited and are posted in a tube wrapped in conservation tissue. A certificate of authenticity accompanies each print. 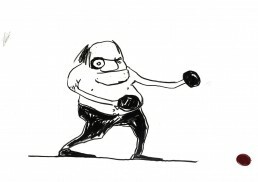 From the series of paintings and drawings of Bareknuckle boxers. Gypsy Tom was a prize fighter from South East London who fleeted between the worlds of Londons aristocracy and his life as docker in Victorian London. Tom was part Gypsy and part Londoner and he came to learn in later life that he was the illegitimate son of a Lord.